How do new Chinese characters come to be created? China has never had much of a “dating” culture, so young people rarely explore possibilities directly, but rather harbor fantasies. Neither money nor looks is everything in a marriage, but they are, as the old saying goes, a good place to start. Perhaps more importantly, they are relatively easily to assess. 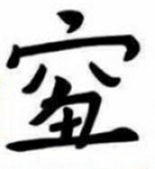 There is no established, officialized character for this, of course, which is written by combining the top of qióng 穷 (the xué 穴 part) and placing under it the chǒu 丑, which is modified to incorporate the tǔ 土. (Chinese has no such expression as "dirt poor," so the incorporation of the "dirt" character slyly shows that the writer is educated and cosmopolitan, and shouldn't be so readily dismissed merely for being poor and ugly.) A graphic of the character is shown at right as it appeared on the Chinese search engine Xīnlàng Wēibó 新浪微博, which declared in the 2018 "unofficial character of the year." The photo at the right shows the wrapping from a product that the manufacturer calls "moji" in English. It is a soft, sweet pastry, about the size of a hen's egg, made from glutinous rice, with bean-and-peanut-based filling and often sprinkled with shaved coconut. The product was produced in Taiwan, where it is a popular treat. The two characters in the box seem to be made up by the manufacturer on the fly, or anyway they do not occur among the 50,000 characters of China's largest dictionary or in any computer characters sets, or in any of the available dictionaries of Hokkien. There is no reason to imagine that most people would have seen them before. And yet they are instantly recognizable, even natural, for Taiwanese shoppers. Each of the two is made by appending the character for "rice" (mǐ 米) to another character which is "almost" right. Rice is among the root characters used as "radicals" in the formation of other characters, so this is a quite normal graph. The first (left) character, corresponding with the Hokkien sound môa, is, without the rice part, 麻. (It is pronounced má in Mandarin.) It usually refers to hemp. Obviously the pastry has nothing to do with hemp, but the sound is right. The manufacturer's addition of the "rice" radical creates a new character that is not one anybody ever learned in school, but that clearly both refers to rice and has a sound like môa. The second character does exactly the same thing. First comes the rice radical 米 again, this time combined with 薯, a character pronounced chî (or sometimes chû) in Hokkien (shǔ in Mandarin). By itself (without the rice radical), this character refers to sweet potatoes (sometimes extended to other root crops). The rice radical identifies the new character as having to do with rice and not roots, while the root part shows the pronunciation. Is this the only way to represent the name of this pastry? No. Hokkien does not have an official writing system, so there is considerable variation in how the language is mapped onto the characters used by different people in writing it. However, if one checks Hokkien dictionaries, môa-chî is normally written with the common hemp character pronounced môa (Mandarin: má) 麻 despite the fact that the meaning is wrong, followed by the character 糍 (Hokkien chî, Mandarin cí), which normally functions as a prefix for pastries made of glutinous rice. A Hokkien speaker knows that the combination is pronounced môa-chî and that it has to do with glutinous rice. Why not use existing characters? So, given that 麻糍 is a reasonably established writing, why would the manufacturer create new characters? Style? Product differentiation? Possibly, but the more likely thing is that the môa/má that means hemp is simply a bit jarring. Characters can be used just for their sound, but it is both inelegant and potentially confusing to use them that way. In a traditional world of handwriting in which one was not concerned with printer's fonts or computer codes, the creation of new characters, especially ones that could be instantly understood, was perfectly natural. In a world of hand painted shop signs and commercial logos, there is also no particular obstacle to creating new characters. And there are clearly people today who continue to find character creation a perfectly normal part of functional literacy. What do language planners do about this? Naturally, character reforms of various kinds, seeking standardization and simplicity, often attack just such new creations. Môa-chî is perfectly understandable when it is written 麻糍, they would argue. And the minor ugliness of using "hemp" when you refer to a rice pastry is a small price to pay for having fewer characters to worry about. So any officialized character set excludes many or most such new creations, despite constant reinvention and minor use in ordinary life. Further, some popular creations have logical shortcomings of their own that would exclude them from officialization even if they were otherwise considered necessary. For example the combination of the radical mǐ and the phonetic má in the first character that we have been discussing already exists in the character mí 糜 (Hokkien bî or mûi), meaning gruel or waste. The only difference is that the rice radical is written on the bottom rather than at the left side. It violates a norm of character creation to use the same radical-phonetic combination to stand for two different spoken entities depending on where the radical is written, although some examples do exist. Thus a language planner would find the new combination of 米 and 麻 to be already in use, like assigning the same number to two different telephones. As to the simplified character set used in China today, all of the characters printed on this page are identical in both traditional and simplified systems. And the two innovative characters in the photo are not part of any official system. Another manufacturer has solved the problem by giving up on Chinese: the name is transcribed as "moki" in Japanese syllabary (since Japanese is a fashionable language in Taiwan these days) and as "mochi" in Roman letters (always understood to be English, also a fashionable language). 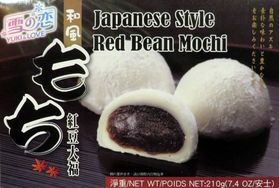 The only generic Chinese name on the package is "red bean great felicity" (Mandarin: hóngdòu dàfú, Hokkien: âng-tāu tōa-hok 紅豆大福). Possibly "great felicity" is (or will become) another term for this type of pastry. If so, I haven't discovered it. But the photo does the job of clarifying what is involved.